On Saturday, U.S. Air Force B-1B Lancer conventional bombers and F-15C Eagle fighter jets flew in international air space in the Sea of Japan, off North Korea’s eastern coast. The flights came ahead of a scheduled address by North Korean Foreign Minister Ri Yong-ho to the United Nations General Assembly. The United States regularly carries out aerial demonstrations using its bombers and fighters to signal resolve to North Korea. The flight follows other U.S., South Korea, and Japanese responses to North Korea’s recent nuclear test on September 3, which was of a claimed thermonuclear device. Moreover, in recent weeks, North Korea has flown two Hwasong-12 intermediate-range ballistic missiles over Japanese territory and into the northern Pacific Ocean. It’s most recent test came last week, before the opening of U.S. General Assembly’s general debate. “This mission is a demonstration of U.S. resolve and a clear message that the President has many military options to defeat any threat,” the Pacific Command statement added. 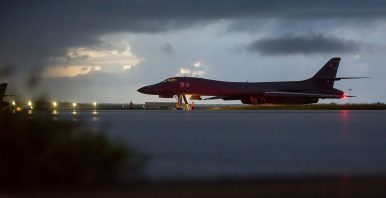 The latest bomber flight comes just days after U.S. President Donald J. Trump, speaking before the United Nations General Assembly, threatened to “totally destroy” North Korea should the United States need to protect itself or its allies. In response to Trump’s threat, North Korean leader Kim Jong-un issued an unusual statement in the first-person, saying that he would contemplate action to “tame” Trump, who he called a “dotard” and a “mentally deranged” leader.